I don’t know who said it, but it is a phrase I have often used and this month there are a number of records that cleanse the soul, here are five of my favourites. But before you jump into the list, I would like to invite you to send in your five favourite tracks of 2014 by 22 December. I will post them up along with mine the next day. 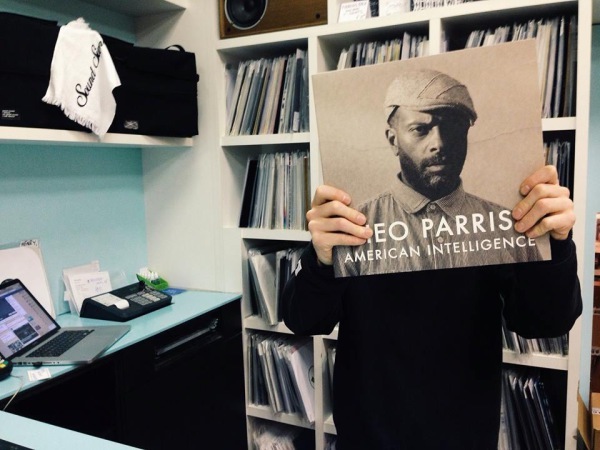 American Intelligence is the first album from Theo Parrish since 2007, and yes it was worth the wait. It is deep and soulful, shot through with jazz influences and full to bursting with killer cuts. The clip I have included is “Footwork” the first single and arguably one of the records of 2014. But there are other monster tracks on this album, the jazzie “Make No War” and the brilliant – “Helmut Lampshade”. Also included is one of the highlights of his recent live tour ‘Ah’ featuring the legendary Marcellus Pittman. Theo makes music of exceptional quality and is a great DJ. Theo along with Moodymann are today’s equivalent of the ‘Hard Boppers’, they consciously return to the black roots of dance music. On the back of the album there is a picture of Theo laughing. This may well be because of the amount of money he will be making off each sale. The vinyl costs a fortune, but it is one album you need. It was reading this review by RA that persuaded me to get this album. I hope after you’ve read it, you will to. “When his father died a few years back, Francis Harris made an album that sounded unlike anything he had done before. Leland was a catalyst rather than a fluke for the New York artist, pulling him away from the dance floor into more contemplative spaces. Shortly after its release in 2012, Harris’s mother also passed away. Minutes Of Sleep was written in the aftermath, which he admits was more turbulent and upsetting than his father’s death. A stirring and complex record threaded with uncertainty, Minutes Of Sleep shows that Harris is not one to wear his heart on his sleeve. Taking in his varied set of influences, it’s a record that brilliantly refigures house music as a deeply personal form of inward expression. “Minutes Of Sleep isn’t the wrenching epitaph you might expect from its backstory—it’s more of an attempt to keep calm in a fierce storm of emotions. The record begins with a bluster of ambient noise. “Hems” and “Dangerdream” are both heady drone pieces touched by Greg Paulus’ trumpet and the mournful cello of Emile Abramyan. From there, things start to take shape with the more rhythmic “Radiofreeze.” Harris channels his grief into something almost sublime, where even the simplest sounds are layered beyond easy comprehension. The album’s few nods towards traditional house music are built like pillars of marble, with kick drums that lumber listlessly (“Me To Drift,” “What She Had”) or dance delicately in suspension (“You Can Always Leave”). “You Can Always Leave” is the crux of Minutes Of Sleep, and one of Harris’s finest moments. It breathes in and out with the organic quality that defines the new music on his label, Scissor & Thread, slowly rising to a gentle climax with vocalist Gry’s heartbreaking lyrics. The words might seem like generic club fare—”We go dancing in electric lights and beats, fantasies/ Till the morning, till the morning/ Breaks the night”—but they take on enormous significance when you realize they were written about the night Harris’s mother died. The song exemplifies the LP’s most striking quality—with a pianist, drummer and keyboardist on board, Minutes Of Sleep feels more like an album from a band than a house record. Harris himself used live samples almost exclusively, avoiding synthesizers or anything else that might sound artificial. “That warm and distinctly human sound palette matches the album’s life-cycle sequencing. Minutes Of Sleep drowsily brings itself to life in its opening run, then peaks in the middle before settling back down to a jazzy murmur with crestfallen moments like “Blues News” and “New Rain”—ruminative songs that feel dejected and hopeful at the same time. There’s been a lot of hype surrounding LP1, the debut album from Tahliah Barnett, better known as FKA twigs. Listen to the clip above and you can see why may compare her sound to Bjork. This is stripped back, raw and futuristic pop music. The hype is definitely OTT, but Tahliah has still produced one of the best R&B albums of the year. Radio DJ: “ “Who do you think is the best re-mixer? In my opinion its one of the best and funniest introductions to a track I have heard. DJ Koze is a German DJ and music producer and a major figure on the Hamburg music scene. He was a member of the German hip-hop crew Fischmob in the 1990s, and later recorded under the name Adolf Noise. He used the DJ Koze moniker in the 2000s and began his own label, Pampa in 2010. “Reincarnations 2” is DJ Koze second album of remixed tracks and is a re-mixer of extraordinary ability. Most re-mixers just tinker with the track, Koze turns them inside out and creates something new and exciting. The three outstanding tracks are two remixes of Mathew Herbert tracks and Moderats ‘Bad Kingdom’ which I’ve linked. I always try and throw in a curve ball – when selecting my tracks of the month. This time its Detroit Techno rebels Underground Resistance. This music requires imagination, sit back close your eyes, Underground Resistance will take you on a musical journey through Detroit, its urban sprawl, dark street, miles of empty buildings, de-industrialisation – this is Blade Runner without Agent Deckard. It’s a difficult record to get hold of, but is worth the hunt and if you know nothing about the politics and ideology of the group, you can read an article I wrote about them here. It’s that time of year when a clean is so important for me. All great but Francis Harris something special. Cheers man.